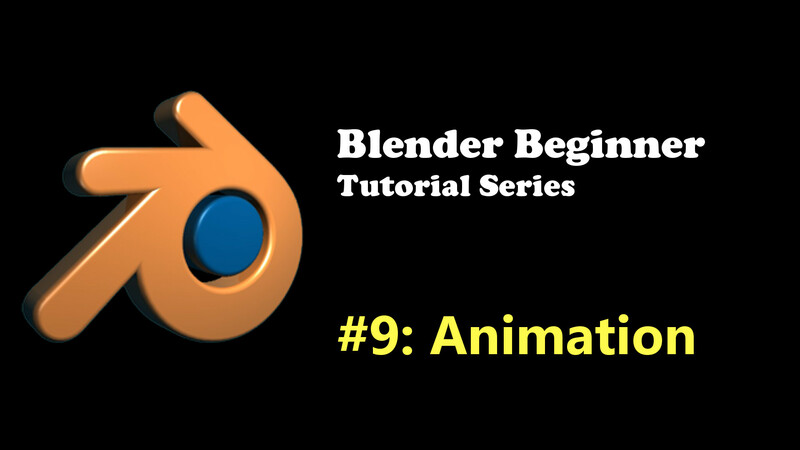 In this tutorial, we will learn how to get started with animation in Blender! Animation in Blender is very quick and easy. If you want to make a box move from point A to another point B in 3 seconds, all you have to do is move the box to point A on frame 0 and then set a ‘key’. 3 seconds down the timeline, move the box to point B and then set another ‘key’. When you play back the animation, you will see your box move from point A to point B in 3 seconds. Simple as that! You’ve made you’re first animation. You can do a lot more than that, though! You can animate how it rotates, as well as how big or small it scales. All you have to do is set keys anytime you want something to happen. A key (or keyframe) pretty much just sets the properties of the object at that specific time. So say, I set a keyframe on the 5th second of a cube that is rotated 30 degrees, that is located 5 units above the Z-axis and scaled 2 times the original. That means, when I playback the animation, the cube will always be rotated 30 degrees, and be located 5 units above the Z-axis and be scaled twice the original size when the playback has passed the 5th second. By setting a key, we have ‘locked’ our object with those properties in place. Here is a tutorial that covers keyframing better in case I explained it horribly! I guess it’s nice to know that Blender can do all of this, but exactly HOW do you do all this?!? To set a key (or keyframe) in Blender, you simply press the i key on your keyboard. You may be presented with a number of options. Depending on whether you want to animate the location only, rotation only, scale only, or a combination of the others, then you select the option that corresponds. Suppose you will regularly need to animate location, rotation and scale all at once. You would then select ‘LocRotScale’. This would set keys for the location, rotation and component properties of the object. If you’re a serial animator and you hate having to select an option every time you press i, you can set the Active Keying Set (found in the bottom of the Timeline next to the red circled button) to LocRotScale. Just press that key looking image inside the textbox and you’ll find those options. Now every time you want to animate your object, you simply press i without having a dropdown option to annoy you! Another way to animate in Blender (and a personal favourite of mine!) is to use the automatic keyframe insertion! This is that red-circled button I mentioned earlier found in the Timeline. Once clicked, it will assume you are animating with the option LocRotScale. If you want to change this to something else, change the Active Keying Set (the box next to it) to another option that you prefer. To set a keyframe, you simply work with your object directly. Say you move an object to point A, a keyframe should already be set (you should see a yellow line indicating a key in the Timeline). If you go to another point in the timeline, and move somewhere else, another keyframe would automatically be inserted. Blender detects any change in the objects properties and sets a key if a property has changed. A bouncing ball animation in Blender. Start with a UV sphere. At frame 1, set a keyframe (using i or automatic keyframe insertion). Then go to frame 10. Move the sphere somewhere else and add another keyframe. Playback your animation (by pressing the play button or Alt+a). That’s all! Of course, there are more advanced types of animations you can do in Blender such as armature animation (that is, animating characters and so on) but that is best left for another day. Same principles still apply though, you use either the i key or automatic keyframe insertion to animate your characters. Give it a go, animate something cool. Download or make a quick car 3D model and animate it driving around a race track. With a bit more practice, you will get used to Blender’s animation system.